A beloved friend passed away last month. He’d been ill. It wasn’t a surprise. But still very sad. He’d been a BIG person…in every way. Big personality, big physical presence. Before he’d become too sick, he’d also been a gunsmith. Imagine a very large, loud-voiced (often spewing loud expletives) guy working away in the gun shop. I used to delight in sending him birthday cards each year that were childlike, such as one with a crayon stick-figure drawing of him holding a pistol and saying “Bang! Bang!” We were opposites, but we’d always had a lot of affection for each other. Recently, I needed some kind of birthday cards for a set of twins, children of another friend, who were turning 7. I decided to make a couple of the banner cars. I found matching Matchbox cars and customized them for each boy. They were well received. Come springtime when his own birthday rolls around, I have a suspicion that my friend’s grandson will be getting his very own happy birthday car just like the one his bampa had. And it will come with explicit instructions that he should be allowed to do whatever he darn well pleases with it (although I’m sure his bampa wouldn’t have said “darn”). This is part of my unofficial campaign to plant subliminal thoughts in my friends’ children that art can be fun. It doesn’t have to be serious. Silly is good, no matter what size you are. Just cruising by from Ree's blog – good example of educating without seeming to. Well done! My cousin used to work for Matchbox in England! 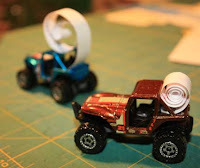 I love those little cars; the paper roll looks like a propane tank! I also really like the idea of being silly. My mom (age 91) is one of my favorite silly people, along with the author of this blog.